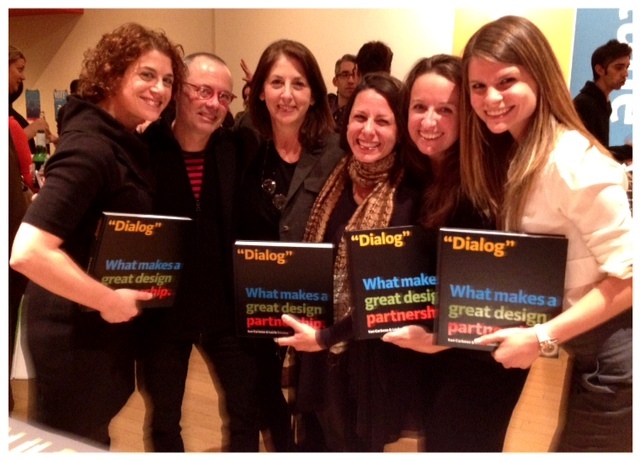 November 8 brought the long awaited release of Dialog: What Makes a Great Design Partnership by Ken Carbone and Leslie Smolan, founders of independent branding agency Carbone Smolan Agency (CSA). To celebrate, CSA held a book-signing and launch party at the AIGA in Manhattan, and the CSA DiGennaro Communications team – Sam DiGennaro, Jordan Katz, Kendra Peavy and Marni Raitt – were on hand to raise a toast to their clients’ success. (from l-r) DGC’s Marni Raitt with CSA’s Ken Carbone & Leslie Smolan and DGC’s Sam DiGennaro, Kendra Peavy and Jordan Katz. 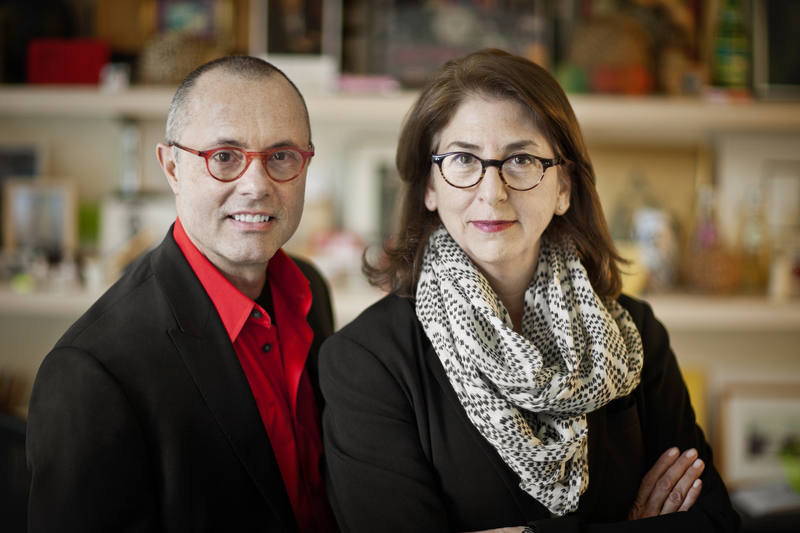 Ken and Leslie, who have done design work for such iconic brands as the Louvre, the Chicago Symphony Orchestra, the Brooklyn Botanical Garden and Aether, are celebrating the 35th anniversary of their partnership with the book’s release. Thirty five years – that’s longer than most marriages! CSA’s success is based on the successful integration of art and design, along with the melding of the unique talents and leadership skills Ken and Leslie both bring to the table. Although they approach their work from opposite sides of the spectrum, they are like yin and yang, like the left and right side of the brain working in concert. Ken is the right brain – the artist with grand ideas – while Leslie is the left-brained pragmatist who keeps Ken grounded and the business running. Dialog, coffee table sized and stunningly rendered, visually documents CSA’s portfolio, 35 years in the making. Chock full of gorgeous imagery, the book also features commentary from some of the world’s top designers about Ken and Leslie’s partnership and creative vision, including Massimo Vignelli and Steven Heller. And the press love Dialog too: Ken, Leslie and Dialog have recently been featured by a number of media outlets including Adweek’s “6 Questions,” a byline by Ken in Fast Company, a best practices piece in Business Insider, with more coverage on the horizon. The book is definitely poised to be a hot seller this holiday season! Dialog: What Makes a Great Design Partnership is available for purchase at the Pointed Leaf Press web site. Posted on November 14, 2012, in DiGennaro Communications, Events and tagged book launch, Carbone Smolan Agency, Dialog, DiGennaro Communications. Bookmark the permalink. Leave a comment.